The Veloudis family home is located at the Andover Forest Homeowners Association. The association says the playhouse violates its CC&Rs primarily because it was not approved. And it is not likely to be approved as it is large, and out of character with the neighborhood and the architectural standards. We can only assume that the board is concerned that if they allow this one playhouse, they would then be required to allow other owners to build their children playhouses as well. The article does point out that because other owners have swing sets, tree houses and other play structures on their property, the Veloudises thought their playhouse would be acceptable. However, their child’s playhouse is considered a detached enclosed structure, which isn’t permitted by the association and, in any event, the Veloudises never asked the board for permission to build the playhouse; it is not the same as a swing set. The board at Andover Forest Homeowners Association is reportedly “reconsidering” its position on the playhouse. And despite their association’s resistance to allowing the playhouse to remain, the Veloudises are still fighting for their son’s playhouse. The Lexington Herald-Leader reports that the story has gained widespread attention, and many have voiced their support for the Veloudises, including the nonprofit advocacy group Drums and Disabilities (DAD) and two Kentucky state representatives. 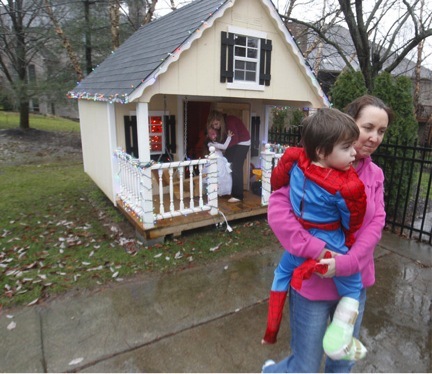 DAD filed a complaint with the U.S. Department of Justice earlier this month against the Andover Forest Homeowners Association, alleging the board is violating the child’s civil rights by denying him his playhouse. The organization also expects to file a lawsuit alleging a fair housing violation against the organization on the child’s behalf.